PP R nineT Scrambler It features parts from LSL, Gilles and Roland ands plus an Akropovic exhaust, Hyperpro fo internals and – crucially – a Rapid Bike fuelling system to clean up the low rpm response. Many of today’s custom bikes are not built for outright performance. Even the stripped to the bare bones cafe racers only have styling cues to mimic the 1960s bikes that the Rockers used to race around the North Circular. But the Rockers built Tritons to maximise performance – taking strongrunning engines out of weaker chassis and transplanting them into Featherbed frames that could take more horses than their original engines could produce. And then they’d tune the engines, increasing bore size and adding eight valve heads. It was all about light weight and horsepower – speed was everything. You could argue that modern retro bikes don’t need more performance – but performance doesn’t have to mean horsepower. At least that’s the ethos of Performance Parts, based in Daventry. This is a company with a history steeped in aftermarket performance parts but as director Colin Peabody points out, the motorcycle market is changing and the need for speed, or at least sportsbikes, in decline. “We built the R nineT because we were keen to promote ourselves outside our performance parts business,” explains Colin. “The market is changing and we’re in a different place now. We wanted to say, ‘if you want to build something like this we are the place to come to’.” Performance Parts built the bike last November to gauge reaction to the changing market at the 2015 NEC. 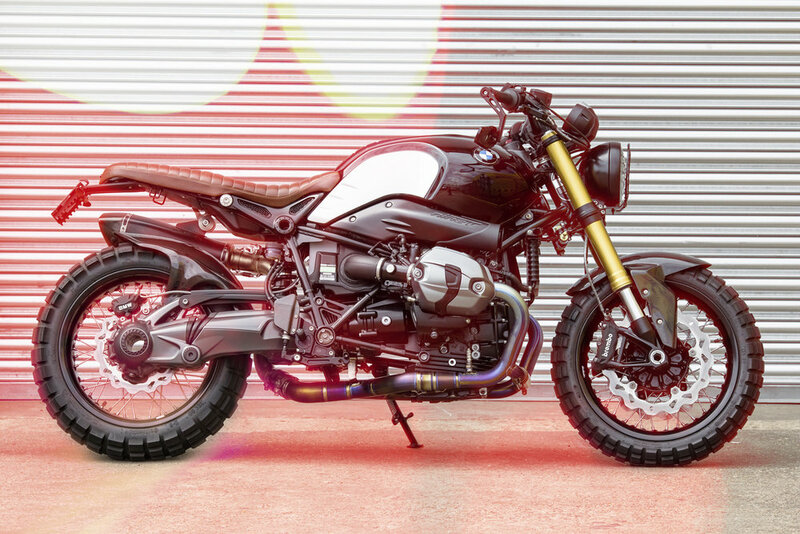 “We built this how we thought the R nineT Scrambler should look. It was us having a go and saying this is our take on it. It’s very subjective. People always look at a bike and pick out things they would like to change. “Our guys had a lot of fun doing it. The key thing is how you want it to look – and we set out to use a lot of satin black to tone down the grey. We’ve learned over the years not to judge everything by your own taste but, even so, there does seem to be a lot of anodised satin silver on the stock bike which looks very unlike BMW quality.” The PP bike uses a lot of the top quality bolt-ons they specialise in: precision-made LSL adjustable bars and levers, plus their bar end mirror. The Black Box This is the Rapid Bike control panel, where you can change settings for traction control (TC), engine braking (EB), quickshifter (QS), launch control (LC) and – careful now – the air fuel ratio (AFR). All the changes happen in real time. There’s a full Akprovic titanium system, which decats the bike and saves considerable weight. The bonus is something like a 10bhp hike in horsepower but Colin plays this down, saying, “it’s not all about power.” It’s high level so the pillion pegs had to be ditched. Then there’s a Rapid Bike fuelling control module, made in Italy by a company called DimSport that does similar modules for cars, trucks and agricultural vehicles. They got into the bike market in 2004. The reason it’s needed is that to pass increasingly stringent Euro 5 legislation on emissions, motorcycle engines are required to run very lean at low rpm. To meet the anti pollution regulations, the fuel delivery is modulated by the bike’s ECU from readings taken at the lambda sensor in the exhaust system in a closed loop. The result is that in slow-speed traffic conditions this restricted fuel supply creates inconsistentcy in power – ie, an unpleasant throttle response. 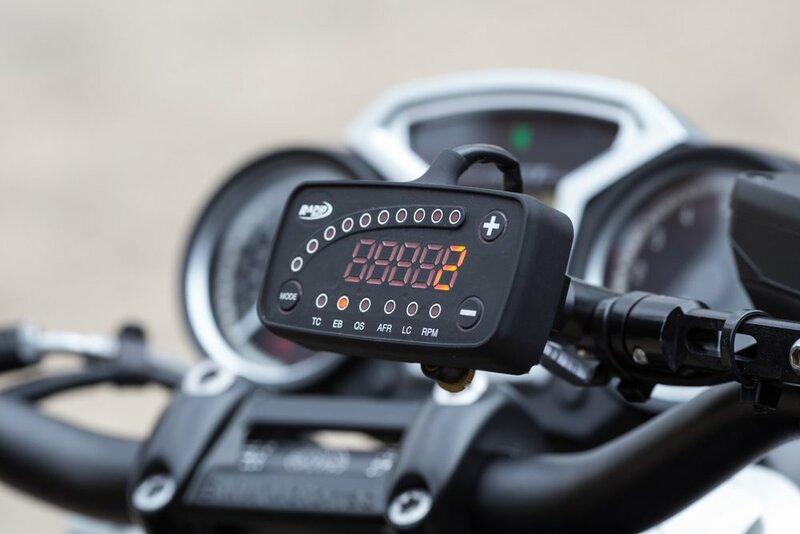 The Rapid Bike module is incorporated into the closed loop system, taking information from the lambda and ECU and adding fuel, dependent on load, throttle position and the other readings. It then manipulates the signal and the ECU fuels according to the information the module is feeding it, effectively richening the mixture at low rpm to restore a smooth and consistent throttle response – perfect for urban riding. To show us how perfect, Colin handed over the keys for us to take it for a spin. Two things hit me as I encounter the first roundabout on the Performance Parts BMW R nineT: 1) The chunky Conti knobblies feel horribly weird. 2) The power delivery is beautifully smooth. The knobblies are a fashion statement, which look great but I fear will take more getting used to than a quick spin from the workshop to a quiet back road for pictures. The power delivery is a visceral pleasure, feeling more like the delightful direct connection of my old single carb Tiger 750 than I’d expect from a modern fuel-injected motor. And Colin tells me it’s thanks to the Rapid Bike module. “It’s butter-smooth isn’t it?” he says with delight. I can only concur with the statement. Utterly butterly. Problem is, I’ve not ridden a stock R nineT so I can’t offer a comparison. However, Colin has brought along his own Ducati Scrambler, which also benefits a Rapid Bike module. I’ve ridden a stock Scrambler and, having ridden Colin’s bike too, I can definitely vouch for the way it transforms the power low down, eliminating any hint of hesitation or lag in around town that’s the bane of many a modern fuel injected bike. There are three different versions of the Rapid Bike module. The base Rapid Bike Easy (from £139) modulates the lambda sensor signal to improve the fuel mixture and injection map. Rapid Bike Evo (from £355) is total injection control and can be upgraded with a quickshifter facility and engine braking management, while the Rapid Bike Racing (from £486) does all that Evo does with the addition of pit lane limiter, launch control, and traction control. Colin’s Ducati has a similar parts list: Akrapovic titanium pipes; Hyperpro suspension; Rapid Bike module. It’s also got a Gilles top yoke conversion to gives adjustability to the handlebars and their fully adjustable footpegs with a drop link to lower the pegs.